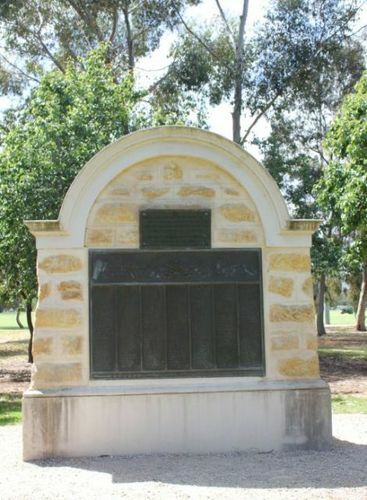 Lower North Adelaide Soldiers Memorial commemorates World War One Soldiers and Airmen. The Lower North Adelaide Soldiers' Memorial, at the corner of Jerningham Street and Mackinnon Parade has been unveiled by His Excellency the Governor ( Sir Archibal Weigall) on March 19. A meeting of the committee to finalise matters was held at the residence of Councillor Wallace Bruce on Thursday evening. The City Council has agreed to take over the care and control of the memorial and to lay out the ground surrounding it. Footpaths will be made and lawns, trees and shrubs will be planted. THIS TABLET WAS PRESENTED TO THE DISTRICT BY COUNCILLOR WALLACE BRUCE.